What are you doing to prepare for the Lunar New Year celebrations? One thing kids can do is read about Chinese New Year. While there are many picture books aimed at toddlers and early elementary schoolers, it’s harder to find chapter books for middle grade readers. 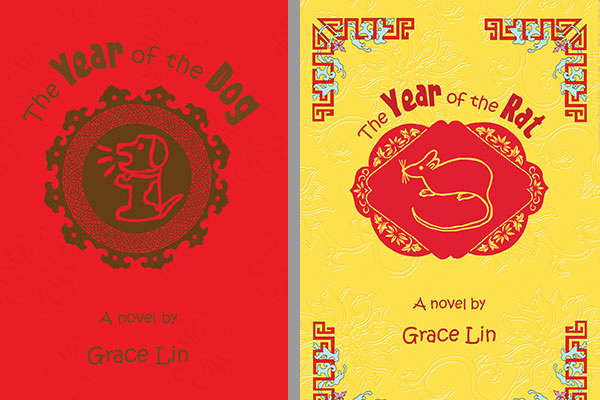 That’s why I love The Year of the Dog and The Year of the Rat, both written and illustrated by Grace Lin. These semi-autobiographical stories are written in the casual first-person style and illustrated with simply drawings, similar to Diary of a Wimpy Kid — only with an Asian American girl as the main character (and a bit less attitude!). The first of the two titles, The Year of the Dog introduces us to Grace, who is also known by her Chinese name, Pacy. Unlike many other books about Asian culture, these novels focus on the Asian American experience. While Lin doesn’t really specify what era these stories take place in — and they seem to be updated with contemporary touches — they feel like they could be a page out of my own childhood in an suburban immigrant family in the 1970s. The book opens as Grace’s family is getting ready to celebrate the Lunar New Year — the Year of the Dog. Like I was as a child, Grace is used to being the only Asian student at her school. That is, until a new girl moves to town. The new girl, Melody, is also Taiwanese American, and the pair become quick friends. Lin manages to cover a lot of ground in a simply chapter book — weaving in traditional folk tales and ethnic identity crises with the more general trials and tribulations of being an elementary school girl. As the title suggests, the book follows Grace through the entire calendar cycle of the Year of the Dog. This 2009 sequel to The Year of the Dog, picks up at the beginning of the next year: The Year of the Rat. Grace/Pacy has another eventful year. Only this time, it’s even more challenging. Her new best friend Melody is moving to California (another realistic touch!) and Grace must navigate the social waters of upper elementary school as the only Asian American girl again. Soon enough, another Taiwanese American student moves to town — only this time, he’s a boy and a new immigrant. Not exactly things Grace wants to be associated with! This book brings up some more complicated issues, such as prejudice and rejection. Lin has said in interviews that the character Melody was based on her real-life friend, Alvina Ling, who later went on to become her book editor! I read these books to Big Brother when he was in second or third grade, but I think they would be appropriate for a fourth or fifth grader to read on their own. Accelerated Reader lists both of these titles in the 4th grade level. Do you know of any other Middle Grade chapter books about Chinese New Year? I’d like to hear about them. Share your suggestions on the comments below! I purchased these books myself and did not receive any payment for this review, which does contain affiliate links. Click on the images or links to order a book through IndieBound and have it delivered to a bookstore near you. HapaMama makes a small commission from sales. Sorry, I don’t know of any other middle grade chapter books about Chinese New Year, but I do love Grace Lin’s books. I’ve read these as ad adult – they’re very good and I can relate to the main character!